Christmas food is undoubtedly something we spend about a whole year looking forward to. The turkey, cranberry sauce, pigs in blankets, mince pies... We love it. However, our traditional Christmas binge is not exactly the healthiest of pursuits, and although you may want to spread the Christmas cheer by packing your child’s lunchboxes full of festive treats, a mince pie a day may not be the best route forward. If your child is already over excited about the festive season, here are four Christmas lunchbox fillers that will help keep up the festive cheer, and make you happy that they’re eating something that’s good for them. Switch traditional sandwiches for some yummy festive wraps and inject a bit of health and colour into their lunches. Take a wholemeal wrap, and sprinkle lettuce and raw greens on it – spinach is great for young minds. Put on a thin layer of lean, cooked turkey and scatter over a handful of fresh cranberries. Fold in the bottom edge, and then roll up. Wrap tightly in a single layer of foil, so your little one can rip in and then unwrap as they eat to avoid losing filling! Potato salad is a great alternative to sandwiches and can be made in a large batch in advance. Just remember to supply them with a fork! Cook and cool new potatoes. Chop into bitesize chunks, and pop into a bowl with some cubed ham, a handful of fresh cranberries, and finely sliced spring onions. Add a little ground pepper, some chopped fresh parsley (optional), a squeeze of fresh lemon juice and a little olive oil – or use low fat mayonnaise. Toss together, and then pop onto a bed of raw spinach or salad in a Tupperware container. There are so many yummy pudding options around at this time of year, so why not blend these flavours into a healthy fruit salad for your child’s lunchbox? Peel and cube a dessert apple and pear, pop in a bowl, and add in the juice of ½ orange to stop the fruit going brown. Peel a clementine or satsuma, remove pith if your little one is fussy, and separate into segments. Add to the bowl, along with some fresh or dried cranberries, some sultanas, and a sprinkle of cinnamon. Stir, and dish into small Tupperware containers. A top tip that would earn you teacher rewards: to keep salads cool, simply freeze a juice carton and use as an ice pack in their lunchbox! Trail mix should be only served in small portions as it’s calorie-heavy, but it’s excellent as brain food at lunch or as a mid-morning snack for student motivation. Make sure to check out your child’s school’s rules on nuts before preparing this, as some ban them due to allergies. Mix equal amounts of almonds, cashews, pecans, pumpkin seeds, dried cranberries, soft-dried apricots and dried apple. Add a little cinnamon, mix up, and then put portions into small pots or ziplock bags. 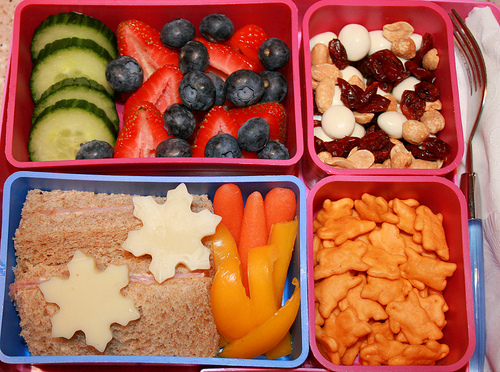 Do you put anything special into your child’s lunchboxes over the Christmas period? Thanks for sharing Louise. Some lovely ideas there!